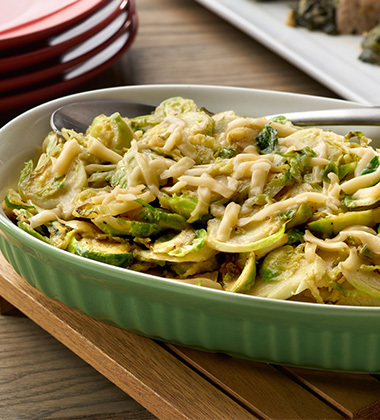 Cooked in browned butter, this creamy vegetable side dish made with Campbell's® Healthy Request® Cream of Mushroom Soup is topped with Gouda cheese and baked to perfection! 1. Heat large pot over medium heat. Add butter. Stir constantly until melted and tan in color. 2. Add Brussels sprouts. Cook until reduced in volume by half, about 2 minutes. Stir constantly. 3. 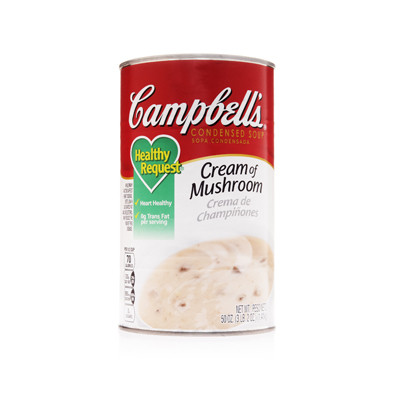 Add Campbell's® Healthy Request® Cream of Mushroom Soup, milk, pepper, salt and nutmeg. Stir until thoroughly combined. 4. Pour mixture into shallow baking pans. Evenly sprinkle cheese on top. Place under broiler until cheese is melted and browned. 5. Using a #8 scoop, portion 1/2 cup onto serving plate. Serve immediately.